Professional Supervision is a core component of maintaining professional practice and accreditation for many professions particularly in the community and human services sector. Professions such as Social Workers, Occupational Therapists, Physiotherapists, Teachers, Nurses, Midwives, Doctors, Counsellors and Psychologists are encouraged to access regular professional supervision as part of maintaining professional standards in their role; engage self care; promote ongoing growth and development; and meet organisational requirements. Throughout her career, Tracey Harris had had a passion for the role that professional and operational supervision has in the workplace. She has developed a systematic framework that ensures supervision remains effective and sustainable over time. As part of the supervision platform and system, Tracey has developed a range of unique resources, tools and documents for beginning supervisory practitioners to assist them to develop the necessary skills to feel confident and supported in their new role. She has developed seven integrated supervision models that provide a common language framework for all roles in the organizational and business context. 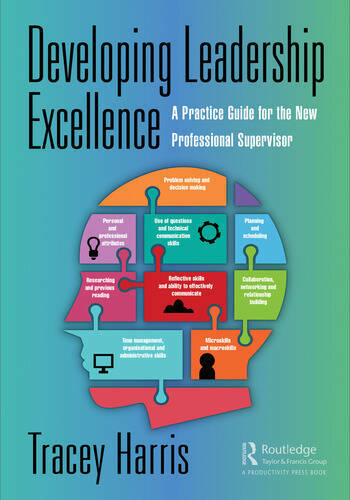 Developing Supervisory Excellence: A Practice Guide for the New Professional Supervisor is the first text of its kind to integrate the existing frameworks of supervision into a comprehensive model of practice, providing new supervisors with a clear procedural and practice guide for conducting professional and operational supervision. In addition, it provides new supervisors with a range of resources to support, record, track, and evaluate the supervision process and outcomes. Outlines the different types of supervision and provides reflective questions to encourage new supervisors to reflect on what supervision is, its purpose, what it hopes to achieve and explores what inadequate supervision looks like. Provides new supervisors with a guide on what to look for in quality training, what key topics are useful in training and concludes with reflective questions for new supervisors to consider when thinking about engaging in training. Provides a detailed analysis of the benefits of providing and engaging in professional supervision. Provides key information for new supervisors about how to set up supervision and build rapport in the supervisory relationship. Explores how to maintain professional boundaries and the process of providing and receiving helpful feedback. Outlined and provides examples of relevant documents to use in supervision given the ethical and industrial nature of supervision. Discusses the value of evaluating professional supervision and includes reflective questions for supervisors to consider as they develop a framework for evaluation. Discusses the core differences between the supervision styles and how to manage the dual role of line and professional supervisor. Outlines an example framework for assessing competency and capability for new supervisors. Tracey Harris is the Executive Director of Amovita Consulting and is a leading speaker and professional on developing high performance in the workplace. Tracey has worked in the human services and corporate sectors specialising in organisational and business excellence, leadership and performance for over 25 years. Having worked as a senior ministerial advisor, Tracey led the social housing reform in NSW with a particular focus on West Dubbo. This policy reform was recognised as a positive policy platform in working alongside the Aboriginal community and Elders who were instrumental in developing new social housing outcomes for this community. Tracey has worked both in senior management and in clinical practice early in her career. She leads the Management and Executive Consulting Division of Amovita and has a career that spans three states of Australia and she has clients in Australia and internationally. Tracey has also provided lectureship at the Australian Catholic University in Brisbane, where she specialised in the fields of public and social policy, field education and mediation for eight years. In addition to her work as Lecturer and as Executive Director for Amovita Consulting, Tracey also has an interest in research on high performance leadership and neuroscience and has developed an integrated model of coaching and supervision in the workplace for high performance outcomes. Tracey is currently an HDR Candidate with Griffith University researching how training in leadership and supervision influences supervisor competence.